Sangdee Gallery has started offering photography workshops for aspiring photographers; novice or enthusiastic amateur, there is much to be found here. Alberto Cosi explains the finer points of photographing interiors and architecture to the workshop held on July 11. August 7 sees the next workshop on the photography of food. A tricky subject to cover, making food appear not only delicious but in a tempting composition requires more than a simple click of the shutter. The following photography workshop on August 21 will be directed by Alberto Cosi and will cover photographing products. A previously held workshop also held by Alberto Cosi was on photographing architecture and interiors. Students found themselves learning successful ways of covering these subjects to make them unique and interesting. Sangdee also offers an acting workshop for popular local thespian Neville Powis every Thursday and on the 14th and 15th of August a weekend long film making workshop. Take a mid-week break and drop in Wednesdays after 5 for a lively indie fusion session with local musicians, starting at 6 pm. Contact [email protected] or call 053-894-955 to make reservations for any of the workshops. By any standards, past or present, the problems – indeed the human tragedy – facing Burma ranks with any in the world, in Zimbabwe or other parts of Africa, in North Korea or the Middle East. It has lasted for decades and a once prosperous country is being stripped of its resources and future to satisfy the greed of its non -elected ‘leaders’ and generals. Over the past decade it is estimated that around ten million Burmese have left their homes and barely a million have returned: a startling figure, especially with a population of only 50 million. Of those who have migrated some two million, possibly more, have fled to Thailand. The exodus across the borders into the Kingdom continues at the rate of 2,000 each day. When they arrive here, they face an uncertain future, living in conditions that are often little better than those they left behind. The only thing they have is hope of some future and the prospect of a job- any job. These and many other startling and worrying statistics were given during a special event held last week at Payap University, where a photographic exhibition, a video film and a series of talks on Migrant Workers in Thailand were given in the ongoing series of lectures and discussions which are held regularly at the Mae Kaew Campus. The round table talks concentrated on the economic, legal and educational problems facing the incomers and ended with a straightforward and moving account by a ‘migrant worker’ who had left Burma many years ago for a new life here and in the process had learned Thai, English and now holds down a job in Chiang Mai. Even so after years here, he still has little status and security. Unlike other countries he is regarded as a ‘migrant worker’ rather than a contributing Overseas Contact Worker. And yet such workers contribute between five and seven per cent to the economic output of Thailand and greatly help its continued growth. One of the intriguing aspects discussed was the seemingly unspoken collusion between Burma and the countries which facilitate the illegal exodus. The Burmese authorities do little to discourage people from leaving (mostly unskilled but also including professionals and political opponents to the regime). Considerable amounts of money return from those overseas and many workers pay a daily charge to enter Thailand to earn a few baht each day. Most of the two million or so workers who have crossed into Thailand come to work, taking jobs which the indigenous population are reluctant to accept designated as the three Ds: dirty, dangerous and degrading. Pay is invariably below the Thai minimum wage, without holidays, accident liability or any security. The situation is, of course, far from unique to Thailand and Burma. World wide it is estimated that 190 million migrant workers are found throughout the world, many in far worse conditions than here. Of those in Thailand about a million plus are registered, but such registration and the prospect of a four year ‘passport’ ended this March. The complications inherent in this and other processes to achieve some sort of ID were outlined at the seminar. (NB. Next week a report on the accompanying photographic exhibition and the related publication: In Search of a Job… any job by John Hulme). Dr. Ken Santitham, the Permanent Secretary for the Chiang Mai Municipality was on hand to welcome visitors and staff from the Asia Education Fund of Nara, Japan. 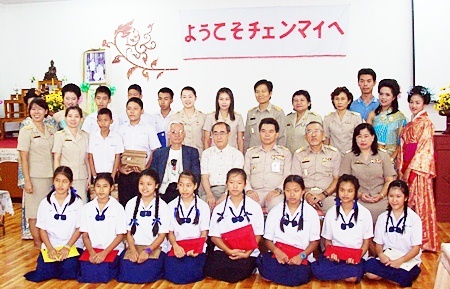 The group came to Chiang Mai to present scholarships to underprivileged students from the Wat Sri Donchai Municipal School on July 12.